RedRat Scheduler provides a mechanism for creating timed events for the output of remote control signals. Each timed event executes a macro, which is a sequence of one or more remote control signals, so the scheduler program includes a mechanism for creating and editing macros. Each timed event can be set to execute only once, a finite number of times or to repeat indefinitely. The Microsoft .NET Framework 4.0. This is now installed by default on most PCs, but can also be downloaded from the Microsoft website. 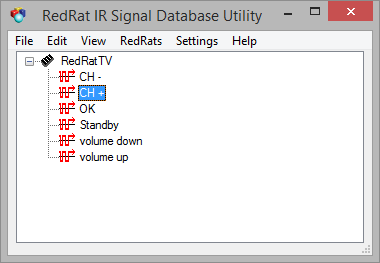 The RedRat IR Signal Database Utility. Add a device/remote (Edit → Add Device/Remote). Select the new device and add an IR signal to it (Edit → Add Signal). In the “Add New Signal” dialog, give the signal an appropriate name, then press the Learn IR button. Point the remote at the RedRat and press the desired remote Control button twice, separating the presses by one or two seconds. When pressing the button make sure it’s a firm press but not for too long. Add as many signals from the remote as you intend to use with the program. Save the signal DB (File → Save As…). The captured signals can be tested to validate that they have been recorded correctly and so will control your TV/STB. This is done by selecting a signal and then outputting it using the Edit → Test Signal Output menu item. The instructions and examples in this section use the USB RedRat3 device, however the irNetBox can be used as well. If you are only ever going to use the Scheduler with one RedRat device, then this step is not so important. The reason for setting the RedRats Name (also called Location) is that when the Scheduler attempts to output IR signals, it has to know which RedRat to use for this operation. Start the Scheduler and bring up the RedRat device list (RedRats → Find RedRats.) which then shows available RedRats. Double clicking on your RedRat3 device will bring up a dialog box in which the name/location of your RedRat device can be set. If you have more than one RedRat and will be using one considerably more than the others, then this one can be set as the default (RedRats → Select Default RedRat). This is done with the Macro Editor in the Scheduler application (Edit → Macro Editor). It has two main panes, the left-hand one showing the list of macros and the right-hand pane showing the actions that have been setup as part of the macro. When a macro is executed, it steps through the actions in the order given in the macro pane. Open the Macro Editor from the Edit menu. Click Add to insert an empty macro. Click Rename to give it a name descriptive of its intended operation. 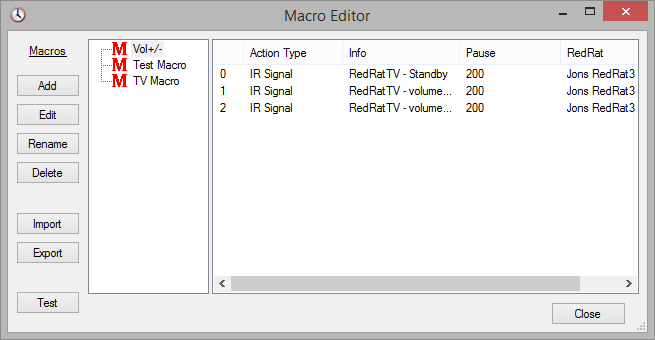 Ensure that the macro is selected (blue or grey background) and then drag an IR signal from the signal database utility to the right hand pane of the macro editor. This will create a new row in the action list. Repeat drag and drop operation for all IR signals that are going to form part of the macro. Action Type: Currently only IR signal actions are supported. Info: This shows the remote and IR signal to be output. Pause (units of ms): Following the output of each IR signal, a default pause is given. This is important so that audio/visual equipment is able to recognize the discrete IR signals rather than seeing one long stream of concatenated IR. This value can be adjusted, for example when turning on a TV or set-top box, it can sometimes take a couple of seconds before it responds to further IR commands. RedRat: The displays which RedRat is to be used for output of the signals. Actions can be re-ordered by dragging them to the required position. Double clicking on an action will bring up an action editor dialog. Both single actions and complete macros can be tested by right-clicking on the action or macro respectively. A timed event is basically the execution of a macro at a particular time. All timed events are listed in the main scheduler window as shown below. 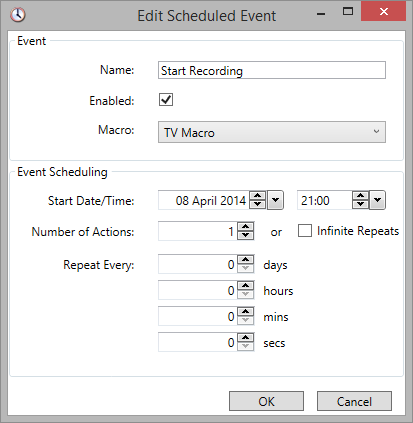 The Schedule menu is used for adding, deleting, editing, enabling and disabling timed events. Even when an event has been run with no further remaining repeats, the event remains listed in the window until explicitly deleted. Once an event has been created, the edit dialog is used to configure it (double-click on the event or use the Schedule →Edit Timed Event menu item). Name: A descriptive label for display in the main window. Enabled: Sets whether this timed event is to run or not. Macro: The macro to be run by this event. Start Date/Time: The time/date at which the macro will be run for the first time. Number of Actions: By default, the macro will only be run once, however the event can be set to repeat a number of times, or to repeat indefinitely. Repeat Every: If the macro execution is to be repeated, then the repeat interval is set here. There are several types of action that can be used as part of a macro. All action types can be edited by double clicking them in action list display. These are the most common form of macro action, and each action is the output of a single IR signal. They are added to the action list by dragging them from the Signal DB utility and dropping then onto the action list. This action displays a message box with a user configurable message to notify the user that a certain point in the macro execution has been reached. Macro execution can continue while the box is displayed, or it can be halted until the user has clicked “OK” in the box. The message box can also be configured to emit and audible beep when it is displayed. Pitch – there are three pitch settings. The number of times that it is to be repeated. Scheduler options are found under the File menu item. If Scheduler is kept running for long periods, you may not want to see it in the system tray. By checking this box, it will be hidden when minimized. To bring up the application again, the icon in the notification area can be used. When Scheduler outputs IR signals via an irNetBox, its default behavior is to open and close the connection each time. In some situations, this could lead to problems, for example if another application starts using the irNetBox while Scheduler is waiting for the next event. It is possible to instruct Scheduler to keep connections to irNetBoxes open permanently by checking this check box. Macro output tests can be stopped. Macro editor tests macro output in the background; helpful for long running macros. Improved handling of double and toggle signals in RedRat core code. Uses the updated RedRat core code – handles no route to irNetBox exception. Improved date and time picker controls. Better logging, to file and log window. Colour coding for scheduled action state. Action names now need to be unique. Fixed issue where long running signals or many simultaneous events may result in timeouts expiring too early using an irNetBox-III. Fixed bug where certain null data caused an exception. Calculation of next event time is now correct on program startup. Fixed bug where signal output failed when using output groups. Drag and drop of signals into macro editor stopped working, possibly as a result of a windows update. Now working again. Fixed an issue when trying to use an irNetBox-III. Macros can be sorted (ascending/descending) in the Macro Editor using the context menu in the tree view. Improved code for writing application state to disk. Added option so that Scheduler will hold the connection to an irNetBox open. Fixed “Hide when Minimised” which wasn’t working. Fixed bug in message box action in the macro editor. Fixed bug preventing the setting of future events with an infinite number of repeats. Improvement to window/dialog sizes and minimum sizes. A timed event with zero delay is handled better. Macros are cleared from UI when new settings are loaded. The macro editor now supports copy and paste. Macro import and export is now supported. Fixes repeat count bug that occasionally crops up. Uses core RedRat code that automatically adjusts USB timeout for very long IR signals. Minor fix: When creating a new output group for an irNetBox-II, it did not allow use of MEDIUM of HIGH power output. Works with the new irNetBox-III. Supports old RedRat3 hardware on new Windows versions (needs device driver V3.4.4). When the default RedRat is updated, it now takes immediate effect. Numerous minor fixes resulting from the use of V3.02 of the RedRat core code. Background threads with exceptions sometimes created error dialog boxes that caused the application to hang as these were not on the GUI thread. This was most likely to happen when using RDP. Fixed bug that caused a null object exception when the code tried to delete a timer that has already been disposed of. Added support for medium and high power output levels in MK-II irNetBoxes. Runs on x64 Windows systems in 32-bit mode. Fixed bug when saving Output Groups – sometimes they were wiped if “Cancel” pressed. Works with the RedRat Multiplexer allowing control of RedRat hardware on remote computers. Logfile can now be closed. A menu tick/check shows whether logging is ON or OFF. Fixed minor bug in macro action editor. Output groups were not handled well. Can now edit macro properties that apply to all actions in a macro rather than having to edit each macro action individually. Supports RedRat3-IIs as well as older versions. Added support for irNetBoxes – types X1, X2 and X5. Some improvements in XML file error reporting. Macros now support message boxes and beeps. Supports the output of flash code IR signals. Fixed occasional bug when opening the macro editor.